Finely indented ropes form the handle, base and mouth of this piece, their beady-texture creating a firm grip. Two artfully crafted horses display in the center of this handmade, aluminum pitcher, their intricately textured hair highlighting the diverse and rich feel of the piece. Heighten the appeal of your Equestrian Collection with this Thoroughbred Pitcher from Arthur Court.. Finely indented ropes form the handle, base and mouth of this piece, their beady-texture creating a firm grip. 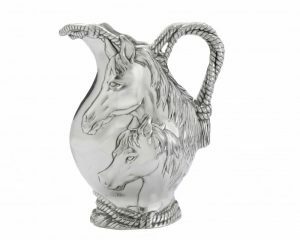 Two artfully crafted horses display in the center of this handmade, aluminum pitcher, their intricately textured hair highlighting the diverse and rich feel of the piece. Heighten the appeal of your Equestrian Collection with this Thoroughbred Pitcher from Arthur Court..